At BCS, we employ a systematic approach to IT Management. Through our Managed Services monitoring and assessment devices, we are able to triage your IT needs into Crisis & Immediate issues along with Short-Term and Long-Term Objectives. Often, before a crisis failure in your IT Environment interrupts your business work processes, our Managed Services tools help identify and resolve the crisis, saving you from the lost time and productivity caused by a typical "wait until it breaks" attitude of most IT Support organizations. We attempt to identify for you the areas of improvement that will deliver to you immediate benefits, and we offer the full range of services required to obtain and deploy them. Most IT Support organizations today fail to help their clients anticipate their future needs. They wait for equipment to break or function so poorly that it interrupts daily business operations to a degree that, in either case, you are forced to initiate a request for support to resolve it. 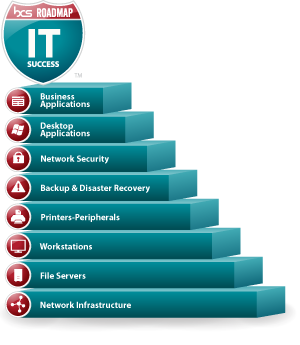 At BCS, we are confident that is not the way you would prefer to manage your IT business requirements. It is our approach, therefore, to periodically assess your IT environment and offer short-term and long-term recommendations to you to help you anticipate and plan for your IT investments. BCS will provide a free comprehensive Network or Business Software assessment, and from it, design a unique Roadmap for IT Success. Fill out the FREE IT Assessment form or call us today at (903) 984-4332 to schedule your assessment.